With the aid of both turntables and laptops, the DJs kept their audience dancing as they spun and scratched records all night from 10pm until after 4am. The set list drew from a variety of hip-hop, R&B and soul musicians including A Tribe Called Quest, Prince, Salt-N-Pepa, Cee Lo and the Jackson 5. Both the music and the cause attracted a lively crowd that included a few influential names in the Cincinnati hip-hop scene like musician Marvin Hawkins, author Kathy Y. Wilson and radio personality Perry Simmons. Friday night DJ Pillo, Mista Rare Groove and April Reign — three of Cincinnati’s premier DJs — performed at Main Event for their second “Selectas Choice” concert. 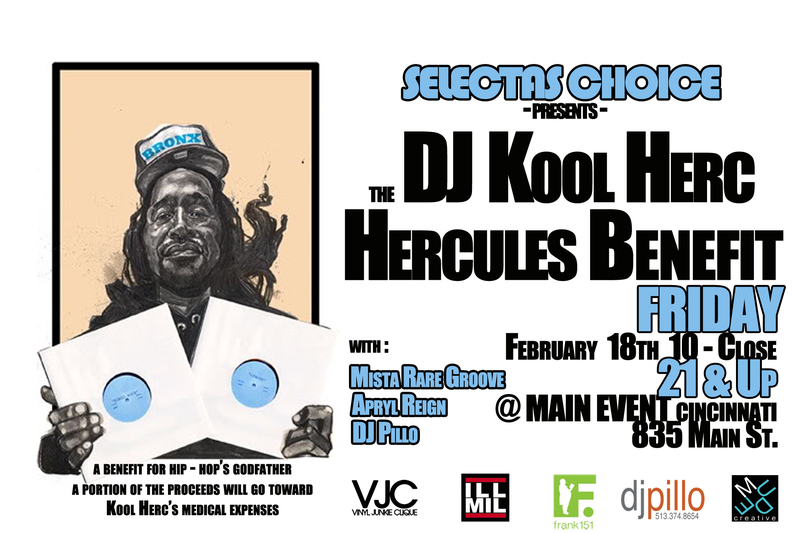 This time they donated the proceeds to help hip-hop legend DJ Kool Herc, also known as Clive Campbell. The benefit concert was part of a nation-wide effort to raise money for his recent medical expenses.